Five years ago, author and artist Jonathan Santlofer was at home with his wife, food writer Joy Santlofer, when Joy began feeling feverish. Joy, who had undergone outpatient surgery the day before for a torn meniscus in her knee, called her doctor’s office and was told to come for her scheduled appointment four days later. That appointment never happened. Joy died suddenly — possibly from medications interacting badly — and Santlofer was left in what he calls a “fugue state” of grief. Though he continued living in the loft that they had shared, he initially put away all of the photographs of his wife, because they were too painful to look at. But as time wore on, Santlofer would bring out the images so that he could sketch copies of them. Over the course of about 80 drawings, he found that his sketches brought him back in time, to the moment when the photographs were originally taken. “Drawing has made it possible for me to stay close to Joy when she is no longer here,” Santlofer writes in his memoir, The Widower’s Notebook. 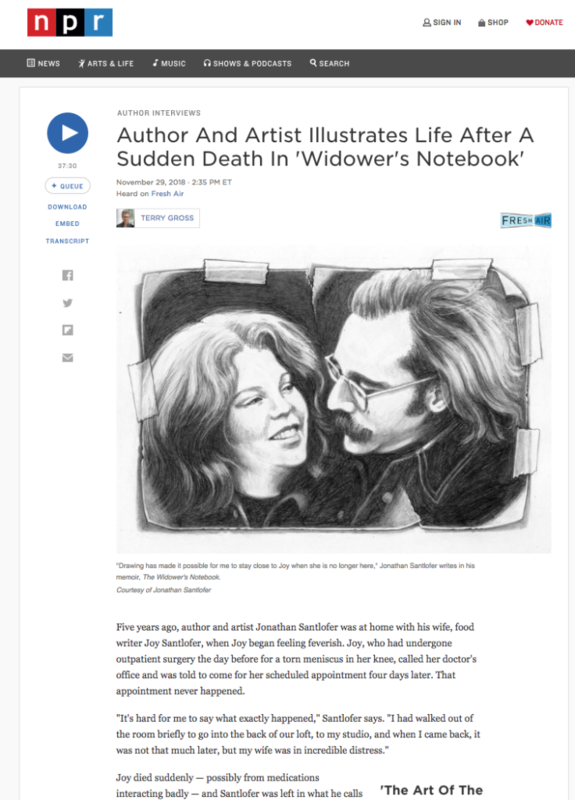 This entry was posted in Events and tagged featured, Joy Santlofer, npr, The Widower's Notebook. Bookmark the permalink.